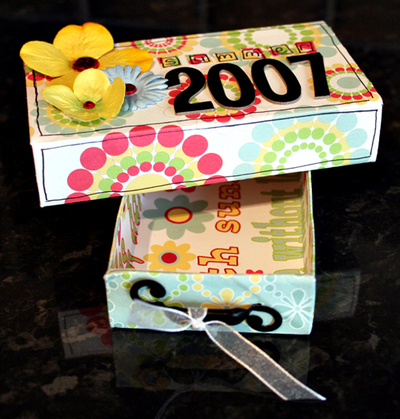 It's a Creative World: Minibook in a match box! Minibook in a match box! When I was asked to be a guest designer for ‘It’s A Creative World’ I was so excited but also really worried about doing something for the blog! 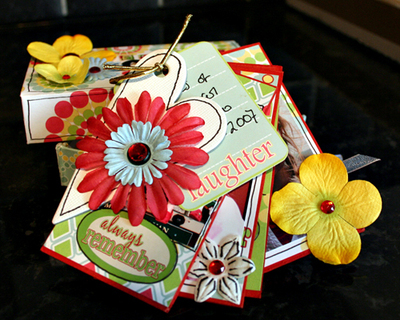 I decided to create a matchbox album because the supplies are so easy to come by (and cheap!). 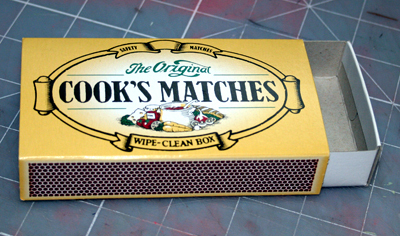 As a base I used a Cook’s Matches box (from Tesco @ 38p), I think this is the cheapest box you will ever find to alter. I used a Three Bugs in a Rug Caboodle kit (Blossom collection) to decorate my box and make the little album but a gorgeous finish could be achieved by using up your scraps! 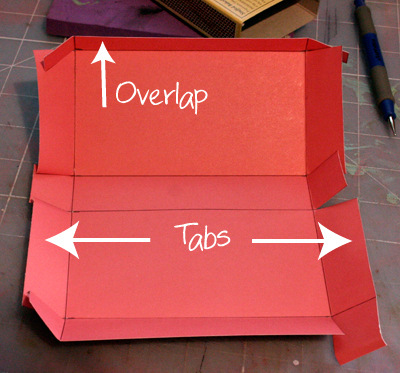 The first step was to create a template of the box and cut it out. I did this by simply placing the box on the reverse side of the patterned paper and drawing around it; I then turned the box along the paper drawing each side adjacent to the previous until I had all the sides on the paper not forgetting to add tabs at the side and an extra little overlap at the end to make it easier to stick down! When it was cut out I used an embossing tool and a bone folder to create the folds. 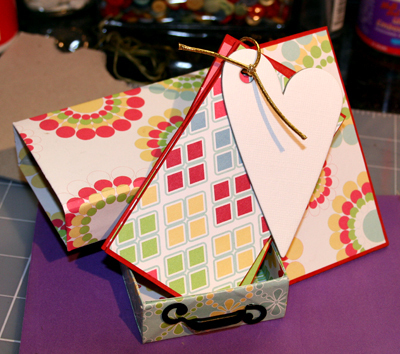 I used the same technique to cover the ‘drawer’ of the box – creating a template out of plain paper before attacking the paper with my craft knife! I lined the inside of the drawer separately and attached a little 7 Gypsies handle to one end to one end of the box. To make the little album I cut four pieces of chipboard from a 12 x 12 sheet ensuring that they would fit into the drawer. 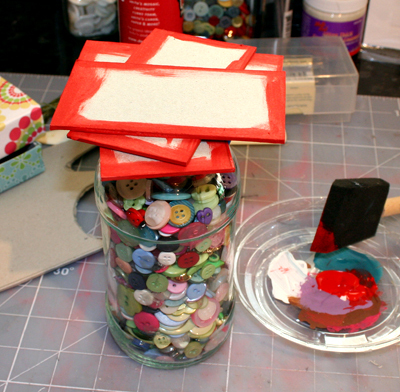 The edges of the chipboard were coloured with some red acrylic paint and left to dry. Whilst the paint is drying, cut 8 rectangles of patterned paper slightly smaller than the size of the chipboard pages (you want to see some of the paint). I used 2 rectangles each out of four papers and adhered them to either side of the chipboard. To bind the book I punched a single hole in the top left hand corner of the chipboard, added a chipboard heart to the front of the book and tied it all together with a piece of gold elastic (I tried a book ring but it didn’t fit in the drawer). Now the album and box are ready to decorate. I chose some photographs from a memorable summer day because the papers were so bright and cheery and kept the design of the album quite simple – it looks really effective. 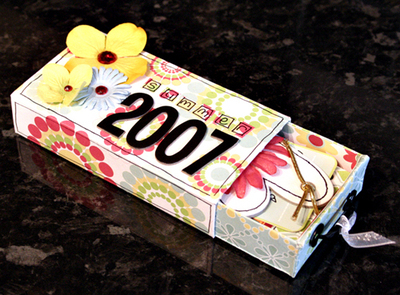 I love picking this little box up and opening it – it is so cute! WOW!! What a great idea :) Thanks Sarah for a truely inspiring project. Wow, this looks absolutely gorgeous Sarah!! 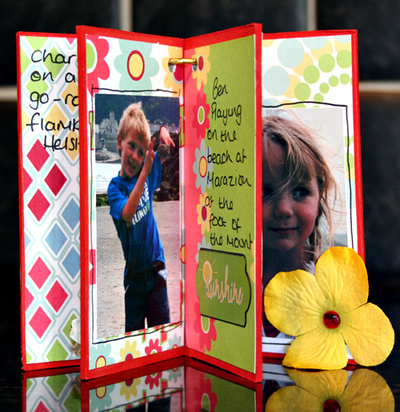 I'll be making one of these for sure :-) Thanks for sharing your fabby idea! oh, this is so cute. if you don't mind... what are the dimensions of the box? no tesco here in germany, so i'll have to find something different. This is absolutely gorgeous, thankyou so much! Thanks so much for the dimensions. I am sure I can find something similar here.